Sana is our best-selling brand of juicers, with superb juicing performance, premium construction, and European styling. 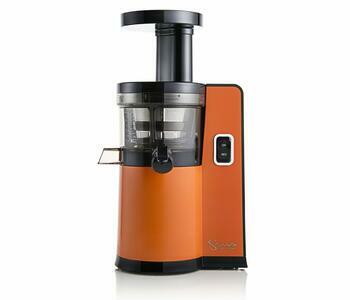 Sana currently offers four juicers, each with their own distinctive qualities. Here is a short guide explaining the differences, so you can see which one might best meet your needs. Those who want to get absolutely the highest yield from their produce. The Sana EUJ-606 has a unique pressure regulation knob. This increases the pressure in the juicing chamber, allowing the produce to be squeezed slightly harder and giving up to 5% more yield than other juicers, especially on hard produce. What produce is it best for? 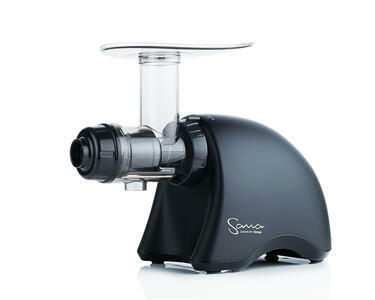 As with the Sana 707, Sana horizontal juicers excel at a wide variety of ingredients. They handle equally well hard root vegetables, citrus fruits, and leafy greens. What produce isn’t suited for it? Like any juicer, soft fruits such as ripe peaches or berries have a low juice content and tend to make a puree with little juice. The EUJ-606 is a powerful juicer able to extact a high amount of juice from a wide variety of ingredients. The included homgenization screen crushes ingredients instead of juicing them, allowing it to make things like nut butter, sorbet, almond milk, hummus, and pasta. Those who want a premium juicer that looks as good as it performs. Those who want the flexibility of juicing softer fruit. The Sana 707 was designed in Europe with European consumers in mind. We often hear how people like the unique shape and the wide range of 11 colors. It has a homogenizing screen for nut butters, almond milk, pasta, hummus, sorbet, and more. It also includes a coarse juicing screen for juicing softer fruit, and a glass juice container and stainless steel pulp container. It handles a wide variety of produce just like the EUJ-606 ranging from hard root vegetables to citrus fruits to leafy greens. The inclusion of the coarse juicing screen is useful for firm pitted fruits (peaches, apricots) and softer fruits like pineapple that tend to clog the screen. The coarse screen is useful, but overly soft fruit like ripe (not firm) peaches, bananas, or avocados simply are unable to be juiced in any juicer. Our best-selling juicer, the EUJ-707 stands out as a versatile, powerful juicer with a very stylish design. 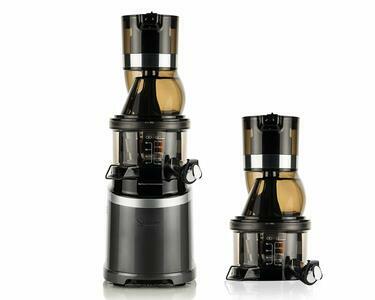 The coarse juicing screen gives it flexibility, and the stainless steel pulp container and glass juicing bowl adds to the premium feel. Those who want an easy-to-use juicer that makes very smooth juice. The Sana EUJ-808 is a vertical juicer that uses a unique double-bladed auger operating at a slow 43 rpm. This creates the smoothest, clearest juice we’ve ever tasted. It also includes a coarse juicing screen for those who like a bit of pulp, or who would like to juice softer fruits. The coarse screen and the juice cap make this juicer great for mixing various ingredients including soft fruits. Because vertical juicers feed produce directly into the axis of the auger top-down, hard root vegetables like carrots and beets need to be cut into smaller pieces to avod jamming the auger. The EUJ-808 has a reverse function to clear any jammed pieces. With an upright style similar to an espresso machine, the EUJ-808 takes less counter space than a horizontal. It also self-feeds and has an auto cleaning function to make cleaning much easier. While it isn’t as flexible as a horizontal model, it is a star at making clear and clean juice with a minimum of effort. Commercial operators like juice bars, hotels, and cafes. The Sana EUJ-909 is the first vertical cold-press juicer designed for commercial use. It has an extra-wide feeding tube whoch can take whole apples, and features an industrial-grade motor rated for 24-hours continuous use. It also comes with two complete juicing head assemblies, so while one is being cleaned the other can be in use. With its powerful motor and large auger, the EUJ-909 can handle just about any type of produce. It is also good for mixed recipes for juice bars. As with all vertical juicers, care must be taken when juicing hard root vegetables to cut them into smaller peices. However, the larger motor and auger makes this less of an issue with the EUJ-909. Up until now, all commercial juicers were centrifugal models. These produce juice quickly, but due to their high speed are very loud and make juice which oxidizes quickly. The Sana EUJ-909 takes the cold-press technology from their home juicers and beefs it up with industrial-grade parts. 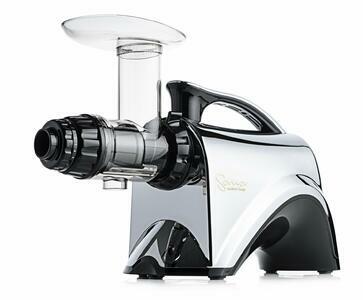 The result is a commercial juicer that makes healthy clear juice quickly and quietly. It’s the first commercial juicer to make true cold-pressed juice, and the only commercial juicer able to properly juice leafy greens.